W3.CSSThe TDI was adopted on January 23rd, 2017. The objective of TDI is to achieve future increase in development intensity, accomplished through the severance of such intensity from one part of the Town to another part of the Town. 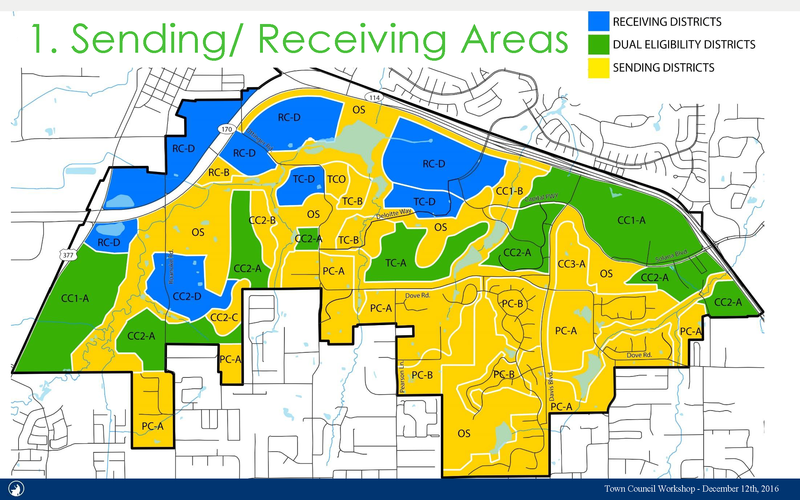 The TDI allows the Town to approve the exportation of non-residential square footage and/pr residential units from one area (Sending District) to an importation of said square footage and/or residential units to another area (Receiving District). Set aside sites for a public facility such as fire stations, museums, libraries, public schools, etc. Only Planned Development Zones are eligible to participate in the Transfer of Development Intensity. Facilitate implementation of Comprehensive Plan elements such as open space, public facilities, roads, trails, etc.